Recently on newspapers, I often find articles about how Japanese style bento (lunch box) is popular in other countries; they say especially “character bento” is popular in America and Europe. Is Japanese style bento popular in your country too? I think bento is an art which is about how beautifully putting different foods in a small space (box). 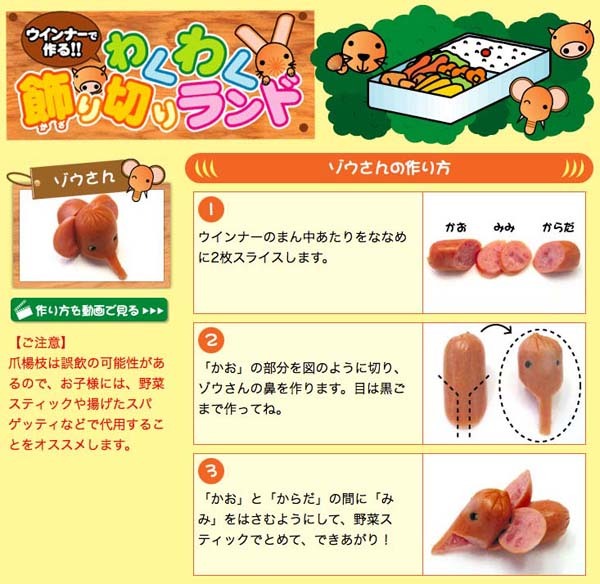 Today, I want to show you how to make cute sausage animals to make your bento pop! All the ideas and the pictures are from ITOHAM FOODS (a Japanese famous food processing company). Prepare some short sausages. I don’t think hotdogs work. 1. Cut one-third of the sausage diagonally, it will be the head. Make one slice in the middle and incise like the picture, it will be the tail. And the rest of it is the body. 2. Cut off the one-third of the “body” part vertically, and cut it half to make hands. 3. Connect the parts with a toothpick. Make a clam with a piece of carrot, and eyes with black sesame seeds. In the website, you can see a “how to make it” video by clicking the green button on the left. 1. Make two slices in the middle, they’ll be ears. One edge is the head, and the other is the body. 2. Make the dace with the head part. The eyes are black sesame seeds. 3. Connect the parts with a toothpick as it’s shown in the picture. Besides these two animals, they have rabbit and chick too, so if you are interested, please visit ITOHAM website. 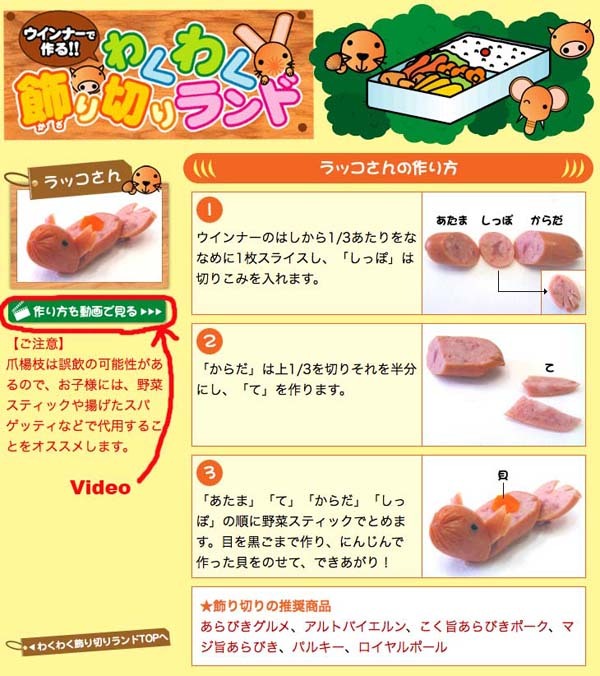 The instructions are in Japanese but you’ll understand because there are lot of pictures and videos.